Editors Note: Please welcome our newest writer Ben Black to our staff, this is a post he sent to the Stache last Friday. Matt den Dekker has been known in his baseball career, both in college and the minors, to make catches worthy of making the Top Ten Plays on the 11 PM SportsCenter. In fact he had made it four times before even making his major league debut with the Mets late last year. In Spring Training last year, March 24th to be exact, in a Grapefruit league game against the Detroit Tigers, Austin Jackson sent a drive to deep center and den Dekker was looking to make another great defensive play. Unfortunately for den Dekker while attempting to brace his fall in his quest to make the play, he broke his right wrist and missed nearly three months. Although his chances of making the Opening Day roster were remote, this injury would open the door for many players to have a chance in Center Field before den Dekker would be healthy. The Mets outfield in 2013 at the beginning of the year was not exactly the model that other teams would want to follow. With the lumbering Lucas Duda in Left and Marlon Byrd, who had been in the Mexican League that winter, in Right. In Center, it was Collin Cowgill (who was the Spring Training MVP) and Kirk Nieuwenhuis making the Opening Day roster and beginning a whirlwind tour of players playing the most important position in the outfield. Six (of the 8 overall) players that played Center Field for the Mets had done so by the middle of May. Along with Cowgill and Nieuwenhuis, Byrd, Jordany Valdespin, Rick Ankiel and the man who finally won the job, Juan Lagares played in Center. While that was happening, den Dekker was still trying to rehab his wrist and more than likely missing out on his chance to make a name for himself in the Majors early in the season. Den Dekker was a more known player than Lagares had been in the minors. To be honest, I knew absolutely nothing about Lagares before his call up to the majors in April. Of course, by the time Lagares had established himself as the everyday center fielder in June, winning the Center Field version of musical chairs, everyone was very aware of him and what he could bring to the Mets. 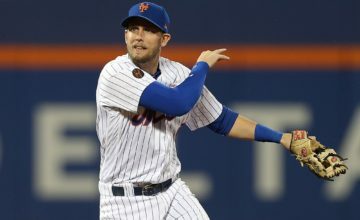 By late July, of the players that were specifically the Center Fielders for the Mets early in 2013, Collin Cowgill was traded to the Angels, Kirk Nieuwenhuis was sent back to AAA and got hurt, Jordany Valdepsin was sent to AAA, eventually getting suspended in the Biogenesis scandal and Rick Ankiel was released. At the same time those players were being removed from the major league roster, den Dekker had finished his rehab and had to try to re-establish himself in the minors to try to make the Mets for at least a September call-up. In an interview with Adam Rubin of ESPN New York last July, den Dekker was asked about missing out while the Mets shuffled outfielders from AAA to the Majors and back. Den Dekker did get the call to the majors late in August, making 12 starts in Center Field and getting 58 at bats, hitting .207 with one home run and six RBI. 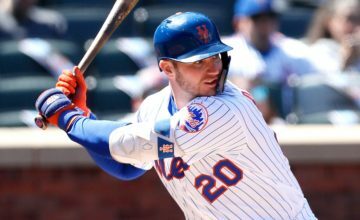 The hard work rehabbing the injury and the success he had in the minors, hitting .291 with solid defense, gave him only a short window of time to impress the Mets decision makers. The problem being that his injury made him potentially miss out on the opportunity that Lagares got to impress those decision makers for a longer period of time. As we reach present day and get ready for the beginning of actual Spring Training games, we see that Juan Lagares is battling again to be the Mets everyday center fielder. His play last season, especially defensively, is being used as evidence by fans that Lagares should win the job and not have to spend time on the bench or in AAA. For den Dekker, he has pretty much has no shot of making the Opening Day roster even if he had a great camp. In fact, it is already being hinted at by Terry Collins, according to the media, that den Dekker needs more time in the minors and a chance to play everyday. 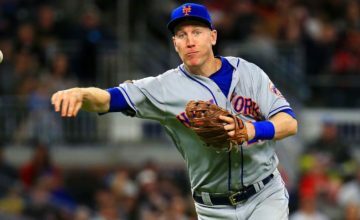 Something in which he wouldn’t be doing in the majors because the outfield not only already has Juan Lagares but Curtis Granderson, Chris Young and Eric Young Jr. as well. The extra problem for den Dekker being that the other three outfielders expected to make the team can also play Center Field. 11 months ago den Dekker tried to add another great catch to his highlight reel and fell victim to bad luck and, eventually, bad timing by breaking his right wrist. If den Dekker had been healthy there is little doubt, in my opinion, that he would have gotten the call up to the Mets before Lagares to try to nail down the Center Field job. We might have not seen Lagares until late in the 2013 season, if at all, and could possibly be debating den Dekker instead of Lagares vs. Eric Young Jr. to start everyday instead. You would never think that an injury to a guy not expected to make the majors late in Spring Training would have such an effect on a team a year later. While Lagares went from a guy very few heard of us to a guy that everyone wants to be the everyday Center Fielder for the Mets, den Dekker has to go back to AAA to try to make it back to the Mets. 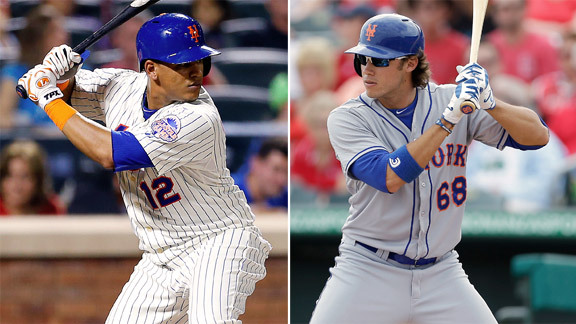 A broken right wrist changed the future of not only Matt den Dekker and Juan Lagares, but the future of the Center Fielder position for the Mets in 2014 and beyond as well.